The origins of the murder of Yaroslavl Oblast assembly deputy and Russian opposition leader Boris Nemtsov are still unclear and may be forever. We are, after all, talking about Russia. However, news reports and the chief suspect’s own statements indicate that an Islamic/Islamist motive may have prompted the killing. When the perpetrator declares his motive before television cameras, we need to take him at his word. This has to be at least one of the motives driving the plot, and cannot be negated by other motives suggested or evidenced by other facts. RosBalt reported on the same day that Dadaev has already fully confessed to investigators and explained his crime as a response to Nemtsov’s perceived or real anti-Islamic statements: “Dadaev stated that in January 2015 he found out that Boris Nemtsov repeatedly issued negstive statements aimed at Muslims living on Russian territory, the prophet Mohammed, as well as the the religion of Islam itself. Being a strongly religious person, Zaur could not tolerate this.” (http://www.rosbalt.ru/moscow/2015/03/08/1375743.html). Indeed, in his January 9th Ekho Moskvy article “Islamist Inquisition”, Nemtsov wrote something that in Europe might bring him a trial date and in the U.S. removal from his job, in particular as the leader of a democratic opposition group. He noted, among other things about Islam as he saw it, that we are experiencing “a medieval Islamic inquisition” that will require “a long struggle to defeat.” He added: “(I)f Christians live in the 21st century, then Muslims live in the 14th-15th. I note: in the 14th-15th centuries was the flowering of the inquisition, trials of heretics, and fires burning people to death” (http://echo.msk.ru/blog/nemtsov_boris/1470712-echo/). Thus, claims by democratic activists such as Ilya Yashin and Aleksandr Milov that Nemtsov never said anything derogatory about Islam are clearly false. They can be seen making these claims in the above-mentioned March 9th Dozhd’ TV news broadcast (see the link above) and elsewhere in the Russian opposition and Western media. However, the murder could have come from additional motives and influences as well, in particular those defined by the fractious nature of Russian and Chechen politics. It could be that in the wake of the furor over the jihadists’ Charlie Hebdo terrorist attack in Paris and Nemtsov’s pro-Charlie Hebdo statements Dadaev was manipulated by people in the security fores and/or Kadyrov and his allies or opponents in Chechnya to kill Nemtsov on the basis of his offended religious feelings regarding Nemtsov’s pro-Charlie Hebdo statements. For Kadyrov or some around him the purpose could be a general destabilization of Russia on the backs of which he might gain his father’s (and many other Chechens’) dream of an independent Chechen state. Recall the massive show of force Kadyrov organized a few weeks ago with several thousand well-armed fighters in Groznyi stadium. Dadaev is reported to be the former deputy chief of one of the battalions in that stadium at the time – the ‘Sever’ (North) Battalion run by the Chechen MVD that Kadyrov’s men control. The Sever Battalion is led by Kadyrov’s cousin Alimbek Delimkhanov, whose brother, Adam, is a deputy in Russia’s State Duma belonging to Putin’s United Russia party. Alimbek runs the siloviki departments in Chechnya. In addition to being a Duma deputy, Adam is on Interpol’s wanted list and a US Treasury Department black list, accused of “acting on behalf of Gafur Rakhimov,” a leading figure in the multi-ethnic, Eurasia-based crime syndicate ‘The Brothers’ (www.treasury.gov/press-center/press-releases/Pages/jl2552.aspx). A third Delimkhanov brother runs Chechnya’s ‘Neft’ or Oil Battalion. Nemtsov had criticized Kadyrov’s show of force and speech at Groznyi stadium in which he pledged that he and his battalions would serve Russia and Putin. Kadyrov also criticized Nemtsov’s support for Charlie Hebdo. It cannot be excluded that a Delimkhanov was acting on his own or in accordance with Kadyrov’s perceived wish. For others, such as siloviki in Chechnya or Moscow, another motive could be to drive the wedge between Putin and the West still deeper in order to force Putin to take a harder line against the democratic, secular opposition and the West. They might also be seeking to put the squeeze on the increasingly dangerous and unpredictable Kadyrov; hence the aggressive investigation. The scenarios involving people above Dadaev’s pay grade might have been reflected in Dadaev’s words about someone above having taken or in the future taking some unidentified decisions. 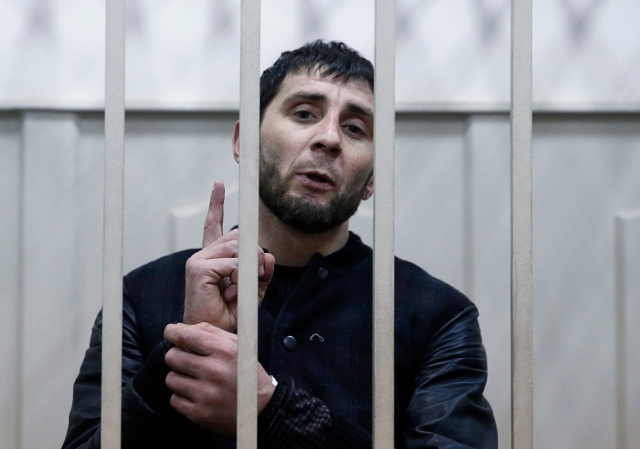 Equally possible is that no one ordered the murder, and Dadaev and his gang operated entirely on their own from outrage over Nemtsov’s ‘anti-Islamic’ statements. If the involvement of larger figures, such as Kadyrov and/or the Delimkhanovs proves true, then the ticking time bomb that is the Kadyrov regime about which I warned many years ago could now be detonating. At a minimum, it cannot be excluded that we have an ‘atmosphere’ issue here. Specifically, Kadyrov’s increasingly reliance on strident quasi-Islamism and militarism, expressed by the battalions he controls, in order to state-build in Chechnya has created an atmosphere of intolerance that helped turn Dadaev on Nemtsov. Kadyrov, Dadaev, and many other Islamist-oriented Muslims would be offended by the following from Nemtsov in his January “Islamic Inquisition”: “(F)or the cessation of religious terror it is necessary to fight for a secular state, that is for the separation of mosque and power (vlasti)” (http://echo.msk.ru/blog/nemtsov_boris/1470712-echo/). Note: On Nemtsov’s early career, please see: Gordon M. Hahn, “From Chernomyrdin to Kirienko and the Rise of the Nizhegorod Group,” Problems of Post-Communism, Vol. 45, No. 5 (September-October 1998), pp. 1-15.